It’s easy to see why so many people are choosing cruises over other forms of vacation; cruises have a huge number of unique benefits than standard vacations simply cannot provide. With a standard vacation, you have to waste a lot of time and money just getting around, but with a cruise, you never need to waste a single second and you don’t have to worry about traveling at all. Everything is taken care of for you, right there on the ship, so all you have to do is enjoy it. November is a good month to take a cruise. It’s the end of the fall season, but it’s not quite in winter, so the cruises aren’t quite as expensive as they would be a month or two later. In addition, November is often quite a cold and rainy month for many parts of the world, so it’s the sort of time when people can feel a little miserable sitting around at home and really want to just get away from it all. Lots of excellent cruises are available in November from leading cruise lines, so read on to learn a little about a few of the best November cruises and find out which one might be right for you. Set off from sunny Florida and make two super stops on this brilliant '4 Night Western Caribbean' cruise from Carnival. A great cruise to take in November, the '4 Night Western Caribbean' cruise lets you get away from the cold weather and short days of late fall and enjoy lots of sunshine, warmth, and comfort in a couple of the world's best tropical destinations. What's more, this is also one of the most affordable cruises to take in November, with very low prices per night and a good range of room types available on board the Carnival Conquest. Speaking of the Conquest, this is the leading ship in the Conquest class and was first launched in 2002, so it's seen a lot of the world over the years. Capable of carrying almost 3,000 passengers, the Conquest is an enormous vessel with a vast range of amenities and facilities to match. You'll never get bored, hungry, or thirsty on board this ship, as there's always something amazing to see, do, eat, drink, and experience on every single deck. A few of the highlights of this Carnival cruise ship are the enormous water slide on the top deck, the hilarious shows at the Punchliner Comedy Club, and the great flavors down at Guy's Burger Joint. 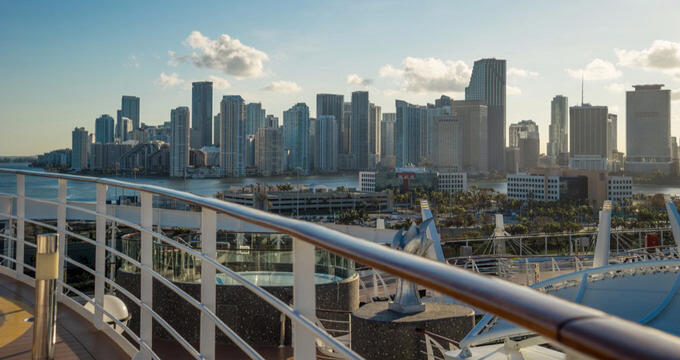 For this cruise, you'll be departing from Miami, FL and heading a short distance around the coast of the Sunshine State for a stop off at Key West. There, you can check out the local lighthouse, visit the southernmost point of the contiguous United States, and enjoy a Key Lime cocktail at a local bar before continuing your journey to the Mexican Caribbean island of Cozumel. There, you'll be able to enjoy some super snorkeling, scuba diving, swimming, and sunbathing opportunities, with lush vegetation and soft sands all around. Ever dreamed of living on your own private tropical island? You could spend all day lying back on the soft sands, feeling the gentle waves lapping at your feet and listening to nothing but the sounds of nature all around you as you while away the hours in total bliss. Well, that's exactly what you can experience on this amazing '4 Night Western Caribbean Getaway' cruise from Royal Caribbean. This November cruise takes place on board the Oasis of the Seas. A truly spectacular vessel in every sense of the word, the Oasis of the Seas is an enormous Oasis-class cruise ship that excels in every single aspect of cruise life. Whether you're looking for world class dining, shopping, accommodation, activities, entertainment, family-friendly features, or something else altogether, you'll find it on board this ship. Not only that, but the crew of the Oasis of the Seas are also immensely friendly and will really make major efforts to please every single passenger. For this Caribbean cruise, you'll be leaving from Fort Lauderdale, Florida and heading off to your one and only stop of Labadee. Labadee is a small port on the northern coast of Haiti. It's not quite a private island, but the whole port area is privately owned by Royal Caribbean and fully, exclusively reserved for Royal Caribbean guests. This means you don't need to worry about hordes of noisy tourists from other cruises and flights crowding out the area and can truly live out your tropical island fantasies like never before. It's the perfect getaway for families, couples, and groups of friends looking to truly spend some quality time together in a world class destination. If you're looking for a great value November cruise, one of the best options at this time of year is to look for repositioning cruises like the '14 Night Spanish Passage Transatlantic Eastbound' cruise from Royal Caribbean. This cruise, like other repositioning cruises, is a one-way, long-distance trip across the Atlantic. It's done to allow the cruise ship to move into a new position ahead of the winter season, and it means that the prices are super low and you get to explore lots of different destinations and take a trip around the world at a great price! For this cruise, you'll be able to travel on the excellent Explorer of the Seas. A Voyage-class ship with all sorts of fun features and amenities, the Explorer of the Seas is fully equipped to cater to thousands of passengers for the full two weeks of this journey. Some of the fun unique features of this ship include a surf simulator, floor-to-ceiling windows in the luxury staterooms, a mini golf course, rock climbing wall, table tennis tables, basketball courts, an ice skating ring, clubs for kids of all ages, fitness and exercise areas and sessions, fine dining restaurants, and so much more. This November cruise sets off from Civitavecchia, which is the main port for Italy in Rome, so you can begin your cruise with a little European exploration before heading across the Atlantic towards the United States. You'll stop at the three Spanish cities of Valencia, Malaga, and Cadiz before leaving Europe, able to explore the local markets, museums, and attractions before voyaging over the ocean and visiting Nassau in the Bahamas where you can soak up the sun and enjoy some Caribbean island life before the cruise comes to an end in Miami, Florida.